Patta Cafe is a month-old baby that’s doing Tibetan, Nepalese and Naga cuisine that’s pretty darn authentic. For a few brief moments, it’s easy to forget that you’re in Delhi and not in some roadside dhaba drinking lemon tea and eating momo in the hills. Hey Champa Gali, congrats on getting this cutie! Bare white walls, big windows for a dose of sunshine, the prayer flags on the door, soothing Tibetan chimes and colourful corners with a bright green bookshelf... It's as if someone shipped a mountain cafe untouched, to Delhi’s hipster pin code. But hey, decor isn’t the only endearing thing about this unassuming little nook. It’s also the fact that it’s run by the sweetest Tibetan folks and serves food that's so worth its Raja Mircha. Just one meal here and it’s not difficult to see that it’s run by a happy staff that gives you nothing but the best that they can whip up. The steamed veg momo (yes yes, we’re very Delhi like that) and Phing with vegetables were a comforting hug after a long day. The carnivore couldn’t help but devour Pork Shapta till the plate (a beautiful ceramic one) was polished clean. We washed these down with Peace Iced Tea and sweet lime soda, a good foil to undercut the spice.Talking of the menu, we spotted the usual suspects like Bamboo Shoot and Raja Mircha from Naga cuisine, Ema Datshi, Bhutan’s loved combination of cheese and chilli and our favourites Thukpa and Shabhalay (local Tibetan burger) from Tibet. There’s also a liberal spattering of Chinese with the likes of spring rolls, noodles and honey chilli potato. So if you’re not experimental, you’ll still be safe with these.Now go, get a big bite of Himalayan khaana (if not clean air) if you're crestfallen that your McLeod Ganj trip has fallen through. 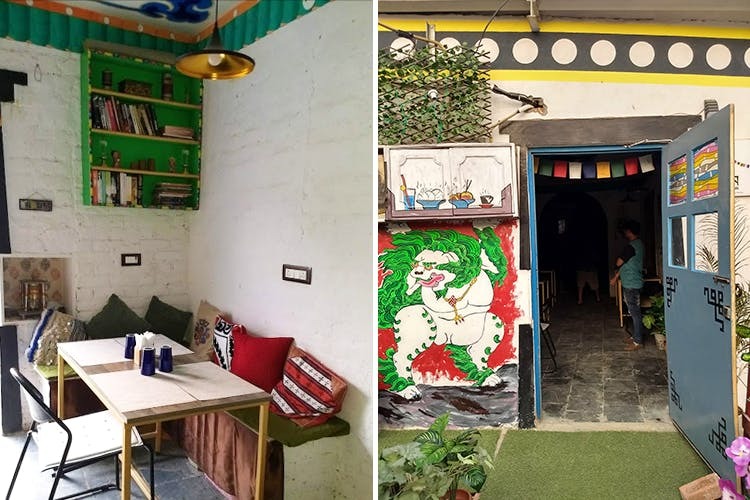 Coffee, flea market shopping and now, a whole lot of feel-good Tibetan food awaits at Champa Gali. So many reasons to go. Right?